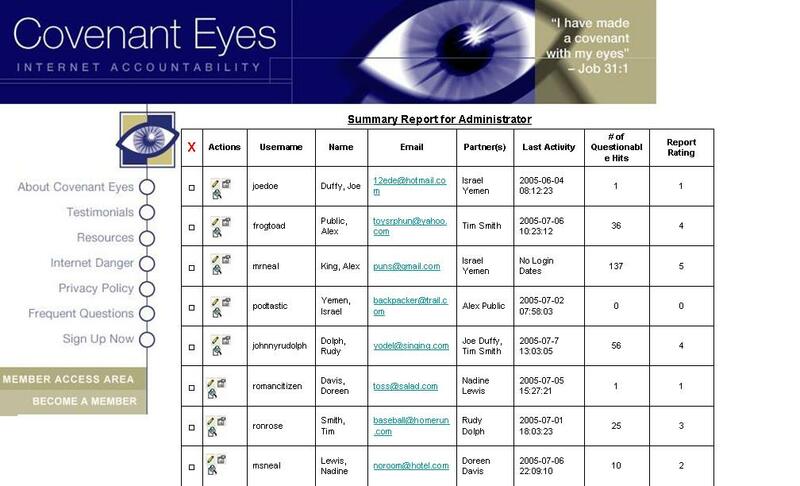 The regular (that is, periodically every day, week, month, or any other time period) summarization (said summarization to be herein referred to as �summarization�) of reports (herein referred to as �detailed reports�) of Internet Accountability (such as that displayed at http://www.covenanteyes.com/files/documents/report.htm) for the purpose of simplifying the viewing by an administrator of multiple reports; and specifically, to list each username under that administrator�s administration (herein referred to as �username�) along with the number of questionable hits on the detailed reports, as well as an overall rating of the report, said rating to be generated by an algorithm designed to represent an estimate of the likelihood that the report indicates intentional viewing of objectionable sites, or that the report indicates a continuing pattern of viewing of objectionable sites. Various algorithms may be used to generate such a rating, but would include an analysis of the number and times of objectionable hits, the nature of the objectionable hits, etc. The summarization may also include links to the detailed report or reports, or any data file derived from the detailed reports (such as a list of only high-scoring sites, or a list of sites within a given time frame). The summarization will be generated periodically and available either by email to the administrator or by allowing access to the administrator to a website. The summarization may also include additional information, such as a link to the username, and/or a link to open up an email to the username, and/or a link to previous detailed reports of username, and/or a listing of times of activity, including latest time of activity, of username, and/or the version of the accountability program present on username�s computer, and/or a listing of all of username�s accountability partners. (the following text was appended 1/11/2006)The summarization report may be accessed either through a password-protected website, or may be generated and transmitted by electronic means such as email, instant message, or telephone (including fax), or may be accessed by a browser toolbar which may be installed on the administrator's browser.